What does a secret correspondence, an elopement and a plot against Parliament have in common? Fitzwilliam Darcy and Elizabeth Bennet have had their fill of crime-solving. Now engaged to be married, their greatest wish is to leave Meryton with its penchant for mysteries for the serenity of Pemberley—if only Mr. Bennet would give his consent! When the investigations begin anew, Darcy and Elizabeth's search for answers unfolds more trouble as Mr. Bennet becomes the target of an unknown enemy...or are his frequent "accidents" merely the desperate act of a lonely father unwilling to part with his favorite daughter? 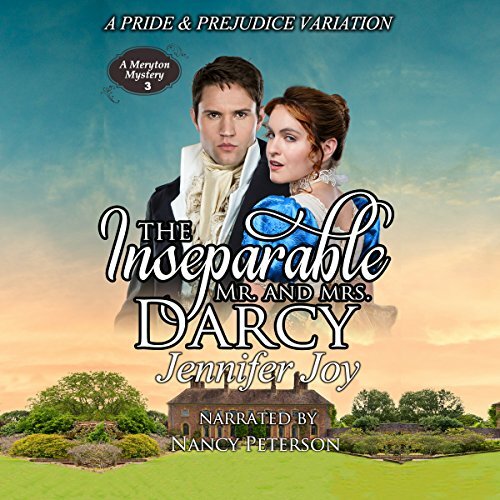 The Inseparable Mr. and Mrs. Darcy is the third novel in Jennifer Joy's A Meryton Mystery romance series set in England's captivating Regency era—when a gentleman's manners were regarded as highly as a lady's reputation and a happy marriage was the ultimate prize (although a fortune was never frowned upon). Listen to The Inseparable Mr. and Mrs. Darcy to satisfy your craving for a fast-paced mystery interwoven with a heartwarming, wholesome romance today! I would definitely recommend this book to a friend. It's a great mystery JAFF story and an excellent performance. What was one of the most memorable moments of The Inseparable Mr. and Mrs. Darcy: A Pride & Prejudice Variation? The discovery of the murderer identity. No spoilers, but many people in the story are not what they appear to be. What about Nancy Peterson’s performance did you like? Nancy Peterson portrays every person in the story wonderfully, making their personalities shine. Lizzy acting like a heroine, but no spoilers. What a great end to the excellent The Meryton Mysteries series. This one doesn't start with a dead body, but the tension and mystery is increasing, due to suspected murder attempts. D&E are delightful, and there is some unexpected headache caused by Georgiana and Lydia. I loved Mr. Bennet and his interactions with Darcy. And expect to be surprised, not everybody and everything is as they appear to be. A delightful ending to a delicious trilogy. I will be listening to this again! excellent writing and superb narration.